Taos fashion designer Patricia Michaels demonstrates how maintaining connections to community is important to maintaining sense of self. This is an interesting theme that shows up time and again in Native American fashion design. "Indian women have always done this. Ceremony is a sacred place, a place of respect. The women all get dressed together in one big room, helping each other. We are taught to enter this space in grace and beauty, we represent our ancestors and are role models for the young ones. It is a part of the cycle of life, the ethics of the tribe. You must feel and look your best, honoring the beauty inside, respecting self, you present your outer self as beautifully as possible. 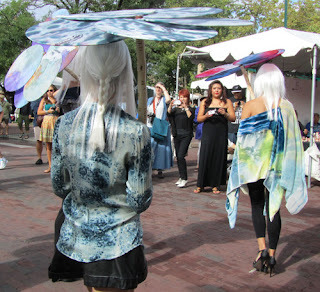 It is important to me to create designs and textiles that can be used both in ceremony and on the street. My designs are not just for Indian people, they are for the world." See more Patricia Michaels here.